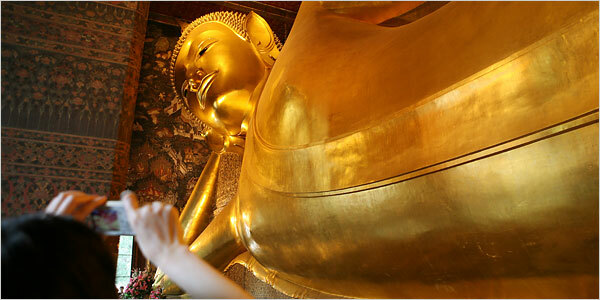 The New York Times said in this travel article that Bangkok is hot, crowded and congested. However, the city also features "surprising pockets of tranquility." The article mentions the Peninsula, Metropolitan and Oriental hotels, the Old Bangkok Inn, restaurants including Eat Me, S&P, H Gallery , Cabbages and Condoms, Vertigo Grill and Moon Bar, the Patpong entertainment district, the National Gallery, the Grand Palace, long-tail boat rides on the Chao Phraya River and the canals, Wat Pho and Wat Arun temples, Soi Rambuttri near Khao San Road and Jim Thompson's House.